Cats kill almost one billion birds and small mammals per year. Don’t Let Your Cat Be a Killer! Huntington-Oyster Bay Audubon works to protect birds and other wildlife, and the habitats upon which they depend through education, public advocacy and conservation action. Cats are pets that belong indoors. They are NOT wild animals. They are warm, loving companions, domesticated by humans thousands of years ago. Cats that are allowed outside are more likely to lead shorter lives. Exposure to transmittable and deadly diseases (such as rabies, feline leukemia, distemper and FIV), the constant threat of being hit by a car, and being attacked by a dog or a larger predator such as a fox are very real and likely possibilities. Human cruelty. There have been many publicized cases of cats found stabbed, burned and shot. Cats can make YOU sick. Cats can contract diseases such as rabies and toxoplasmosis, both of which can be transmitted to humans. They also can carry parasites, such as ticks, fleas and worms, into the home. Cats will kill wildlife no matter how well they are fed. They do not always hunt because they are hungry, they hunt because of an innate urge to hunt. Bells are not a deterrent since wildlife does not recognize the sound of bells as dangerous and most cats will learn to hunt silently, even with the bells. For the health and happiness of your cat, for the benefit of wild animals, and for your peace of mind, please keep your cat indoors. And remember...if you are no longer able to care for your cat, do NOT release him outside. Chances are, he will wind up dead. Please take him to your local shelter. Don't abandon your cat! Many bird populations are in a serious and steep decline due to three major causes: habitat destruction, window bird collisions and cat predation. When you add up these losses, the math is chilling. Hundreds of millions of birds are killed by cats each year, and between 100 million and a billion die from window collisions. Factor in habitat loss and you are now looking at an unsustainable loss of these species. Cats also kill prey animals such as mice, chipmunks, squirrels, rabbits and other small mammals, competing with native species such as hawks, owls, foxes and other larger wild predators that depend on these animals for their survival. Statistics show that the combined numbers of birds and small mammals killed each year by cats is close to one billion. Allowing a well fed house cat to compete for wild food sources places native predators at a disadvantage. Bottom line, cats are an invasive and alien species and do not belong in our ecosystem. 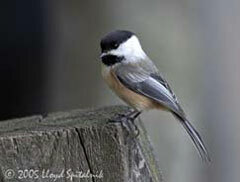 This cheerful bird is a popular and frequent visitor to backyard feeders, making it vulnerable to cats. 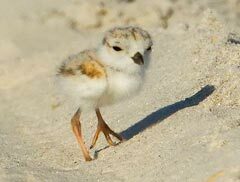 The piping plover is a Federally Threatened Species and frequently preyed upon by cats. Provide window shelves to permit your pet to monitor the outdoors from the safety of your home. Play with your cat each day. Paper bags, tissue paper, and cardboard boxes are sources of unending delight when you are away. Plant kitty grass (available in pet supply stores) in indoor pots so your cat can graze. Provide routine veterinary care, including annual check-ups and vaccinations. If you can, provide a safe, outside enclosure, such as a screened porch. Consider adopting a companion cat for yours to play and interact with. Spay or neuter your kitten before the age of six months.